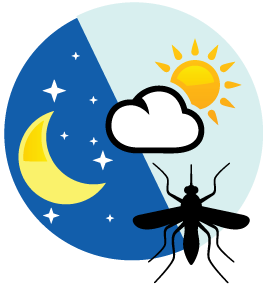 Missouri data regarding mosquito-borne infection can be found on DHSS’s Data and Statistical page (updated weekly). Continental United States Zika Data can be found at CDC’s Zika site. The Zika virus (Zika) is spread to people primarily through the bite of an infected Aedes aegypti or Aedes albopictus species of mosquito. Mosquito transmission of the Zika virus is found in over 50 countries and territories worldwide, including North, Central and South America, the Caribbean, Pacific Islands and Africa. There have been travel-related cases of Zika virus infection in Missouri, but there have been no reported cases of Zika infection due to a local mosquito bite. Surveys are being conducted to determine if the types of mosquitoes found in Missouri can carry and spread Zika virus. We know that mosquitoes that transmit West Nile virus are present in our state, so people should take precautions to protect themselves and their families even if Zika virus mosquitoes are not found. There are no vaccines to prevent Zika virus disease and no drugs to treat it. Most people with Zika will not have symptoms. Once a person is infected, he or she is likely to be protected from future infections. However, they can pass the virus on to others if bitten by the Aedes mosquito while the virus is present in their blood. If infected, the virus can stay in the blood for about seven days. If a person is infected, Zika can also be spread through sexual contact. The most common symptoms of Zika are fever, rash, joint pain, and conjunctivitis (red eyes). If a person does get sick, the illness is usually mild with symptoms lasting for several days to a week, beginning one to two weeks after being bitten. People usually don’t get sick enough to go to the hospital, and they very rarely die of Zika. For this reason, many people might not realize they have been infected. However, Zika virus during pregnancy can cause serious birth defects, including microcephaly and other severe fetal brain defects. The two most effective methods of Zika prevention include reducing mosquito populations and using personal protection measures to prevent mosquito bites and sexual transmission. Mosquitoes like to bite day and night!